My first time eating NC pnuts. I'm a SC girl so not bad at all. I bought two 2lb bags and gave one to my sis-in-law and she loved them. Finally found a great place to buy raw peanuts! It's hard to find a GOOD supplier of raw peanuts. Well I found one in Bertie County Peanuts! Great quality at a fair price. These are very large peanuts. We were amazed at how big they were, and I'm sure our Scrub Jays were just as amazed after getting used to tiny ones bought somewhere else. Delivery was fast, and I love the little baskets they are in. The price and shipping costs were very competitive with other venders. The peanuts were packed well and very fresh! These peanuts taste so great. Purchase the 10 pound bag. We roast 2 cookie trays of them in the stove each week. They stay fresh. They taste awesome. Great delivery and on-time. I love boiled peanuts, went to myrtle beach and on the way back was looking for green peanuts, none to be found. When I arrived home there was a booklet from you folks advertising raw peanuts I ordered 10 lbs. soaked them overnight, boiled and them and have so far consumed 2 quarts. Love the size and quality of the product. Glad I found a source. Bought two pounds of raw peanuts to boil. They are the best boiled peanuts we have ever had.....big, perfect peanuts. Will order regularly now that we have experienced the quality. We have purchased Bertie Co. products both in Windsor and online. We are always pleased with the service and the selection. The raw peanuts were delivered promptly (withing 4 days) and the squirrels are thrilled. They've invited all their family and friends to join them in our yard. The blue jays also like raw peanuts in the shell. Their only problem is that they cannot carry two at one time. So, thanks from all our backyard friends. Very good quality, I've never gotten such good quality peanuts from the supermarket! Prompt service, great taste. A winner! A company that goes the extra mile! I've never purchased raw peanuts and certainly never had them shipped! But we don't have road-side stands selling raw peanuts in Michigan, so I decided to make my own. They arrived within only two days! And imagine my surprise when my 10 lbs arrived in a charming basket, perfect for display in my kitchen. Thank you! I'll definitely use you guys in the future. the arrived fresh and on time. I would recommend to a friend or family member. We lived in GA for about 10 years and were addicted to boiled peanuts. You can't get them in TX or the green peanuts to make them. I ordered 4# of green peanuts. They came quickly and were well packed - no damage. We have roasted and boiled the first two pounds. I did not see even one bad peanut. The rest are in the vegetable drawer in the fridge and we will probably cook them for Independance Day. All I can say is Yum! Delicious peanuts! I purchased the raw in shell and roasted them myself. The order was perfect when it arrived and shiped fast. Thanks. I am an ole NC boy who lives in CA. I order peanuts from Bertie Co Peanuts regularly. They are the best I have found anywhere. You should try them! I hope 5 is the Highest and it isn't backwards.. I had a great experience and was nice to do up some boiled Peanuts at home. The nuts arrived quickly and became 4 Lbs of boiled goodness.. I will order more when my current frozen supply runs out.. thank you . These raw peanuts arrived ahead of schedule. Very pleased with the large size, uniformity & freshness. I will be ordering again. We boil, then freeze the raw peanuts to share with friends during the winter. We've had nothing but GOOD comments and the same people ask each year (several from NC). The raw peanuts were fresh as usual . Roasted up and tasted great. We came from GA 2 years ago, where we could buy raw peanuts at corner farmstands... we haven't been able to find them anywhere around here. I found your website and loved the history. We decided to give it a try and place an order. We were NOT disappointed! GORGEOUS peanuts in a lovely simple basket. Boiled our first batch and they were wonderful! I can't wait to order some of the beautiful gift baskets for my family and friends this holiday season! Thank you SO much! We have really enjoyed these peanuts, as have our squirrels. We would like to boil some of them, but we aren't sure how. Can you help us with that? This is the second order from Bertie County Peanuts. Both orders were filled and shipped promptly, arriving in excellent condition. Great peanuts! Great price. Happiness is a big bowl of hot roasted peanuts! Your product fills the bill! Super cute displayed in a basket. Moved to wa from nc and have been craving boiled peanuts. Had them sent to my mom's house in ca for my visit in a few weeks. Fast and friendly service. Will definitely order again!! I am delighted with your product and the bliss of having s ready supply of fresh roasted peanuts! I have never been disappointed with your product. Been away from the South for quite a few years, Ut has no green/raw peanuts and only canned or refrigerated boiled. Now I can do like the roadside stands that are are just right. My husband's from GA and boiled peanuts are the way to his heart! Bertie County Peanuts is the best place for them! The quality and prices are unbeatable. The shipping SO fast! Thanks again! I bought both in shell and out of shell peanuts and was pleasantly surprised by the size of the kernels and the taste. I liked the reciepes that were placed inside with the nuts. These raw peanuts are awesome. Much better than the inconsistent size and quality of the canned peanuts being sold here. Great taste. Great quality. Excellent delivery. Very happy! Boiled peanuts are a comfort food from my childhood in Hawaii. Finding raw peanuts available online was a surprise. I am very pleased with the quality of Bertie's peanuts and the ease of ordering them online. I recently purchased them as a gift for my sister. My peanuts were perfect in every way, and delivered promptly. I needed some peanuts for boiling. These came out great. Minimal rejects and taste great! I needed raw peanuts and could not find any anywhere near me. The order was completed quickly and came in a well-protected package. The peanuts were great! The peanuts are great. I purchased the 10lb raw peanuts in shell for boiling. I was growing tired of looking for peanuts and coming up short most times, in stores up here in the north. So I made the decision to shop online. I found where ill be making my purchase from now on. no more coming home empty handed. not only are the great, but the shipping time is a huge bonus. I'd like say Thank You to the Bertie County Peanuts Family for a quality product. I will be shopping with you again. The peanuts were good and they arrived to my home fast I will order again. I love making (and eating) boiled peanuts. The raw peanuts were great and made wonderful boiled peanuts. I mis ordered. Ithought these were green so I could boil them. Not very good for boiling. Do you sell GREEN peanuts for boiling??? No, we do not sell green peanuts. And, we'll be in touch regarding how to boil dry peanuts. I was disappointed that the peanuts were dried. I hoped they were going to fresh, green peanuts straight from field. I can purchase the same peanuts here in my home town. Very delicious when I boiled them last weekend, Very high quality product! Sorry about that - the correct in shell peanuts are on the way! If you like doing it your way, but raw peanuts and have fun. Excellent raw peanuts...large and flavorful! Perfect for roasting or eating them raw. These raw peanuts in the shell are great! very high quality, my boiled peanuts turned out great! the peanuts are amazing. I will be ordering more very soon. Thank you so much. and they are very reasonably priced too. Price, quality, taste, size, and lack of empty shucks are unbeatable. Thank you for the best we've found. They also arrived earlier than anticipated! I HAVE NOT RECEIVED MY SHIPMENT YET! You will. Supposed to deliver tomorrow according to FedEx. I moved from Florida to Colorado and was happy to find that I can get raw peanuts shipped here in late spring. I thought I'd have to wait until the end of the summer, so needless to say I'm a happy camper! Make sure to order plenty ahead of time though, as I ordered on a Friday and they were not sent out for delivery until the following Wednesday and I didn't get them until Saturday. Looking forward to having boiled peanuts all summer!!! Love the basket that comes with them, and the peanuts were great boiled! Will definitely rider again. A little more expensive than others, but great peanuts. I will be ordering more in the near future! I ordered the raw peanuts they arrived on time and they were so fresh ( I boil mine) they were amazing !! I ordered 2 bags of the raw peanuts. I received dried out nuts. The shells were so dried out. I wanted to make boiled peanuts and had them cooking in my crockpot for 3 days! I threw one bag out. Sorry to hear that you didn't like the product. Dry, raw peanuts are what you have to use during the spring as the new, green peanuts have not even been planted yet. To use them for boiling all you need to do is soak the dry nuts for 24 hours - then boil away! We'll be in touch. They are terrific, love to roast ourselves. Our parrots, our pup and the humans here love them! Once had a problem, fixed immediately! Great Company!!! Really good peanuts, fast shipping and very reasonable cost. Thank you Bertie County Peanuts! The family has always been in love with boiled peanuts, raw peanuts are difficult to find in WNC. Your raw peanuts were found to be of excellent quality and flavor and contained virtually no debris due to your great dry cleaning and sorting/grading process. I Love My Raw Shelled Peanuts! This is my 3rd or 4th shipment of the shelled raw peanuts and it always comes 100% fresh and consistent. Delivery is always as promised and it tastes really good! Completely satisfied, boiled for 5 hours and tasted delicious. Good size as well. Came super fast and made amazing boiled peanuts! Loved the peanuts and they were delivered quickly! Love the quality every time! Great product. Delivered when they said it would. I love to use these nuts in my recipes. They are of high quality and very fresh. 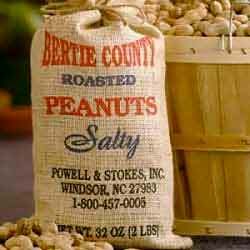 I am very pleased with the products I order from Bertie County Pnuts. I've ordered many times before. Always just before the holidays, and I've never been disappointed with the product or the service. I can tell you if something goes wrong with your order, they are right on top of things. Correcting the order and getting the product out to you ASAP. I'm nuts for these peanuts. I just love the quality everytime!! I was craving some boiled peanuts but couldn't find any raw peanuts in any of my local stores or organic grocery stores. When I checked online I found Bertie's had the best price with the best reviews. Ordered three 2# bags and they arrived in a fairly timely manner. I really liked that they were large in size too! Like the peanuts as they are fresh and sweet. Will be buying from them all the time. A vendor we use sent me a gift basket last year. We liked the products so much that we have been giving peanuts for presents to family and friends for special occasions and thanks and will continue doing. Thank you thank you thank you!! I am so happy I found you!!! I was craving boiled peanuts and couldn't find raw peanuts locally...and then I found you!!! Reasonable prices and super fast shipping made the relationship grow even more!!! I am a customer for life!!!! These were delivered so fast and we used them to boil and they tasted delicious!! We have been using your products for years. First for cooking and then for Christmas gifts. Now for our 4 parrots who get one each day and they look forward to your raw peanuts. Thank you for having RAW peanuts. Craving some boiled peanuts and thankful I found a farm with the ability to ship raw peauntus. Boiled em up and they are delicious. I will definitely be buying peanuts from them again. They are amazing! Bertie County peanuts are the BEST RAW IN THE SHELL PEANUTS I have ever purchased. I will be a repeat customer. I recently purchased four of the 2 lb bags of raw peanuts in order to make boiled peanuts in my crock pot. I'm pleased to say these came out excellent! I put in 2 lb of the peanuts at a time, put as much water in the crock pot as I could fit along with 1/3 cup of salt. It takes time, about 12 hours on low, and stirring and adding some more water to the pot as the cooking goes, but they came out as perfectly as I remember them when I lived in Alabama! Shipping was very fast and they arrived safe and sound up here in Rhode Island! Posted By: Joe Felber Sr. They were great. I soaked them over night then boiled them all day. Delicious! Perfect peanuts which we share with the blue jays in the winter. Hard to get quality dried raw peanuts in Colorado. Was missing road side boiled peanuts so I ordered 10 pounds from BCP. Order came in on time and was packaged properly. Let them soak for 8 hrs then 8hrs boiling with a salt and they were ready to eat. Reminded me of home and enough left to share with co-workers and friends that have never had them before. Peanuts were clean and of good quality...Better than last year's nuts. 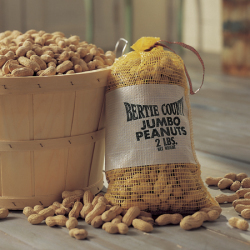 Bertie County peanuts are the best in the world. Love fresh peanuts and these were great! A little taste of heaven far from peanut country! I love boiling these raw peanuts, they are fresh and good quality. I love the bushel basket they came in. Even though January is not the growing season for peanuts, the ones I purchased from Bertie County were large, clean and very tasty. I boiled them and honestly cannot tell the difference between these dried ones and fresh ones. This shipment contained nuts of less quality than last shipment -- many cracked/broken nuts and taste is not up to previous shipments, sorry to say. Sorry to hear that the peanuts did not meet your expectations. We'll be in touch. They have a good size with nice flavor. The 10# basket is how I started out buying pnuts from you-all!Great to see it again! Good as expected. Our parrot loves them. Raw peanuts are fresh tasting, great for boiling or roasting. Our neighbors are from NC and brought some back for watching their home while at a 50th class reunion. Made the shelled and fell in love with them. Just tried the unshelled roasted in a salt brine and they also are better than store brought. Got our kids hooked on them also. I am from Kansas. Never made boiled peanuts before. I decide to give it a try and ordered 4 pounds of peanuts. Oh my gosh... I was impressed with the size and quality of the peanuts. I will definitely order again. My boiled peanuts came out fantastic. This is the second order from Bertie Country and we loved them. I received my order really fast which is always great! excellent quality and make great boiled peanuts,better than the green peanuts in this area. Large, healthy and very tasty and the company ships quickly. I am new to buying peanuts, online or otherwise. My yearly pilgrimage to Costco to buy unsalted peanuts for the native squirrels was about it for me. But then I got introduced to something called "boiled peanuts", definitely not a southwest treat. My online search for RAW peanuts lead me to Bertie's. I never knew that peanuts could be so large and perfect. My first attempt at boiled peanuts turned out to be a huge success, so much so that I am not sure this case of peanuts will ever be tossed out to the Colorado squirrels. Just to let you know, we visited our cabin a few days ago. I put out a pile of Costco (Hoodies) peanuts and a pile of Bertie's. Well the verdict is in. The jays and the squirrels examined both piles and decimated the Bertie's first! They are the plumpest and richest peanuts I have ever bought. This was my second purchase from Bertie peanuts, and they are the freshest largest peanuts! Thank you! I have been missing my boiled peanuts since I left Savannah. Found this site so I thought I would give a small order to check them out. WOW!!! First the site was easy to navigate, delivery was fast and the peanuts were outstanding. They were large and fressh. Will be ordering again. Purchased 6 lbs. of the Bertie County raw, in-shell peanuts for boiling and roasting. These nuts are the freshest and cleanest, I have purchased, compared to other bulk peanut suppliers I have used. The speed of delivery from placing the order was fantastic. Had my peanuts in 3 days. For the quality and amazingly low price I will definitely purchase more from Bertie. We boiled a bag of these huge peanuts! Like being home in Georgia! Delicious! These were wonderful. I boiled and froze some for later. I love and the birds LOVE your peanuts.Very good batch and the basket is reusable! Growing up in Georgia always having a bowl of peanuts in the fridge. These raw penuts are amazing quality and now I get get them in the middle of the us. I think I have found the best way to order peanuts,I can put a bag full at each feeding location and save time and steps! Thanks for a Great product as usual! Received my peanuts and immediately put a pound in an overnight soak. The next day some cajun spices and a whole lot of salt with the nuts in the pressure cooker. 2 hours later delicious cajun boiled peanuts. Next peanut season going to try to get some greenies if you guys sell them. Great product and arrived right on time. My husband and I are from the south and grew up eating raw peanuts. These are so big and so good! We are thrilled we can get delicious peanuts sent to us in Colorado! We are looking forward to ordering more. Thank you! The best buy anywhere on raw peanuts is the 8x2# bags.Very clean and fresh! Very few empty shells. Large in size and good consitent quality. Highly recommended. Live in CO now where there are now raw in shell peanuts. These fill my boiled peanut requirements and more! Bought a case for gifts to neighbors & folks you want to acknowledge. Added recipe for parching. They're fabulous. I had just bought an air fryer and it came with a rotating drum. I ordered the peanuts before knowing the settings but I just used the conversion chart and they're perfect. 325 degrees for 20 minutes. Very Happy with these peanuts! I made my first batch of boiled peanuts with these. They where delicious and turned out great! I am well satisfied with my purchase. The 8x2# bag peanut offer is to me the best because I can keep a bag handy in several places and they are the same high quality raw peanuts that Bertie is famous for! These nuts are high quality. I love freshly roasted taste. I got some raw peanuts to make boiled peanuts - these were great and a big hit with my coworkers when I took them into the office... Thanks! These peanuts are super fresh and crunchy. Great fresh taste. I bought them for the. A knyard squirrels, but I will keep most for myself! The peanuts arrived earlier than expected and were the same good size and quality as the many times before! Thanks! Living in New Jersey. 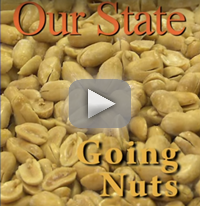 Bertie County Peanuts brings "The South to my Mouth!" Awesome! These are the best way to keep peanuts around for the birds most all the time. Exactly the type of peanuts I wanted. Received them two day after I ordered them. This is the best way to buy peanuts for your birds.They store easily on site where you want to use them and as always(a trademark of Bertie)are of excellent quality and very clean!